Anti-GMO propaganda targets human insulin. In the late 1970s scientists used genetic engineering to piece the gene for human insulin production into E. Coli or yeast cells, essentially turning them into tiny insulin factories. Before this technology, diabetics had to inject themselves with insulin from ground up pork and beef pancreases. The human stuff offers a lot of benefit over the animal variety: it’s more useful for controlling blood sugar levels and it causes many fewer allergic reactions than the animal-derived insulin. A number of anti-technology activists launched a coordinated campaign over the past week by misrepresenting a recent small Japanese study that identified six patients with Type 2 diabetes who began developing Type 1 diabetes after starting insulin. 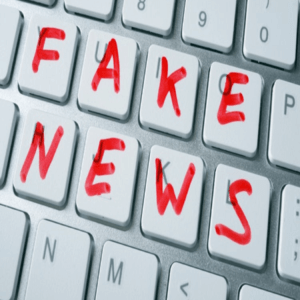 The actual study makes no mention of GMO insulin or the animal-produced variety, which is perfectly safe, as Kevin Folta, head Horticultural Sciences at the University of Florida and an expert on genetic engineering, points out on his blog. We all depend on insulin, a hormone synthesized in the Pancreas, to control blood sugar levels. Elevated blood sugar can lead to a variety of metabolic disorders and long-term damage to various organs. Type II diabetics produce too much at first, leading to insulin resistance, a state where the body just does not respond to the hormone and blood sugar levels remain high. Eventually type II’s do not produce enough, so they need to control blood sugar with drugs, or in some cases administer insulin injections to manage their levels. Insulin for human use used to be purified from the pancreas of slaughtered animals. The preparations obviously would contain other potentially reactive proteins, which presented an attractive solution for recominant DNA technology. Recombinant insulin was first generated way back in the 1970’s, and today is generated in yeast or E.coli in massive fermeneters. The recombinant (GMO) insulin is infinitely more pure, safe and available. But for ideologues, facts be damned. GMO Free USA posted the ridiculous infographic featured on this page, taking it down just this morning after they were swamped with ridicule. Another soldier in the anti-GMO demonization campaign, Sayer Ji, a blogger at GreenMedInfo, tried to argue that recombinant human insulin causes an autoimmune reaction for two reasons: one, because it comes packaged with other ingredients to keep it in soluble, injectable form; and two, because it is not identical to human insulin because the protein folds up differently. Ji argues this 3D folding difference makes synthetic human insulin an immune system target and subsequently causes the reaction that develops into type 1 diabetes. Ji’s argument make no sense if you know anything about the pathology of type 1 diabetes. The autoimmune response is caused because the body makes antibodies against proteins on the surface of the pancreas cells that make the insulin and kills them. The insulin molecule itself has nothing to do with with the immune reaction responsible for the disease. Saying the reaction found in the study is a result of ‘GMO insulin’ and implying it would not be the case of pork-produced insulin is just fallacious. It is vital that the word is spread about the true effects of this stuff (including sudden and unexpected deaths) on many diabetics. It is vital too that pro-GM scientists in America are NOT allowed to get away with making out that GM insulin has been this great GM success story. It is far from being so. I don’t recall a single instance where a diabetic has felt better on the GM insulin than the animal; I’d be glad to hear from any. Insulin is made, in principle, the same way GMO corn starch and GMO sugar in cereals are. To start, the DNA sequence for human insulin is inserted into the bacteria E. coli, which creates an organism that now has DNA from two very different species in it. This new E. coli is a genetically modified organism (GMO) and serves as a cheap factory for mass-producing the human insulin protein. After a while, the E. coli bacteria has produced large amounts of the human protein to the point where the protein can be extracted from the bacteria cells and purified before being packaged into insulin shots. The insulin protein produced via genetic engineering is chemically identical to the insulin protein made in a healthy human body. Another issue, which Ji and his ilk leave out, is that the patients in the study all had genetic markers that conveyed a high risk for development of Type 1 diabetes. In the past, type 1 diabetes was called juvenile diabetes because it was mainly diagnosed in kids and teenagers. But, in recent decades more and more adults are coming down with autoimmune diabetes. Basically the patients included in this study were already at high risk of Type 1. 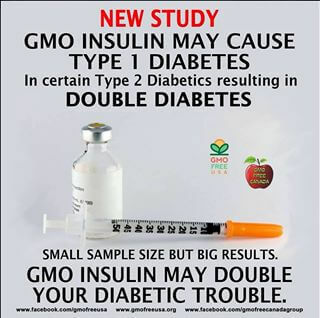 Once again, anti-GMO activists like those at GreenMedInfo and GMOFreeUSA rub their crystals and align their shakras in a message that stands to strike fear in those using safe and dependable insulin therapies. This kind of fear mongering is just an extension of their normal routine– condemning good technology and products to fit their own agendas, even if it causes harm or death to others in the process.